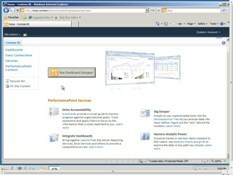 A data source connection can be made to data within Excel files that have been published to Excel Services on a SharePoint site. Published parameter values can be modified from within PerformancePoint Services. This is useful when a parameter is an input to the value of a published cell; this could be used in a KPI, for example, and enable the dynamic change of that cell value from PerformancePoint Services. In PerformancePoint Services the security settings for data sources are stored in each data source. For Excel Services workbooks, you have the choice of having all users connect by using the Unattended Service Account, or you can authenticate using Per-User Identity. Per-User Identity requires Kerberos protocol. You cannot connect to an Excel Services data source when the site or library containing the workbook you are trying to connect to is set to Anonymous Access. In the Category pane of the Select a Data Source Template dialog box, click Tabular List and then click Excel Services. Click OK. In the center pane, click the Editor tab. In the Data Source Settings section, select the method by which to authenticate to the data source. In the Refresh Interval box, enter the duration in minutes for the data to refresh. In the Connection Settings section, type the URL of the SharePoint site. From the Document Library drop-down list, select the SharePoint document library where the workbook is located. From the Excel Workbook drop-down list, select desired workbook. In the Item Name drop-down list, select a Named Range or table. Only one Named Range or Table is supported per Excel Services data source. If you connect to a Microsoft Office Excel 2007 workbook as a data source, you must type the Item name; it will not appear in the drop-down list. Your selected Named Range or Table can be later seen on the View tab. A column from that Item can be set as a Time Dimension and configured from the Time tab. To view a demonstration of how to create an Excel Services data connection in PerformancePoint Services, watch the following video.